War artist George Pepper produced an impressive array of paintings. 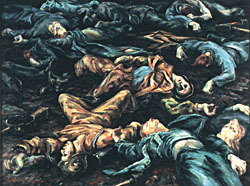 Above: Dead German Paratroopers. George Pepper painted with a quick intensity that seems consistent with his life. His days were filled with adventure and experience and he followed the call of his art through war and peace with equal enthusiasm, painting all the way. Born in Ottawa in 1903, Pepper moved to Toronto and studied at the Ontario College of Art. Restless, he went off to paint and further his studies in England, France and Italy. He eventually returned to Toronto and in 1930 he began teaching at the Ontario College of Art. In March 1943, Pepper answered another call. He enlisted as a war artist and served with the 2nd Canadian Infantry Division in Northwest Europe. In the field, Pepper painted watercolours which dried fast enough to keep the dust from sticking to the surface of the paper. Many of these studies were used as colour and detail reference for later oil canvases. His loose and spooky paintings are filled with the colours of army life. 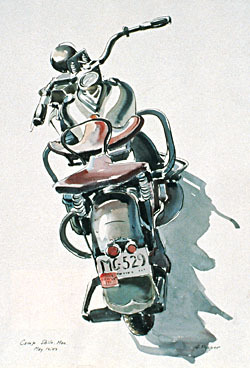 He painted everything he saw, tanks and bikes, and the young men of war during some of their more private moments. After leaving the army in June 1946, Pepper returned to teaching. He painted in Newfoundland, the Northwest Territories and Spain, and was commissioned to paint three large murals, one of which hangs in the Veterans Affairs Canada building in Ottawa. He left us with masses of artwork, over 169 pieces in the Canadian War Museum alone. He died Oct. 1, 1962, on the 18th anniversary of the date he was reported missing in World War II.